HALIFAX -- For decades, Mi'kmaq elder and historian Daniel Paul says hasn't been able to walk through Edward Cornwallis Park in Halifax without the bronze figure of the city's controversial founder staring down at him. After more than 30 years trying to shed light on what he sees as Cornwallis's atrocities against his ancestors, Paul joined a group of demonstrators Sunday at the site where a statue of Cornwallis had been taken down just days before. "To me, it was a symbol of white supremacist thinking," Paul told reporters about the statue that stood in the park for some 85 years. 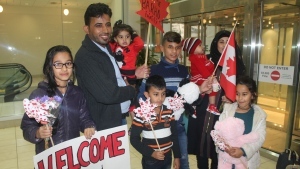 "I'm glad that our Nova Scotia society is progressing to the extent where the general population is beginning to view something like that as an impediment to good relations." Demonstrators played drums and sang an Indigenous honour song on Sunday as dozens of people gathered to revel in the removal of the Cornwallis statue from the park bearing his name. The statue "had such a nice view," organizer Suzanne Patles said with a laugh as she stood on the concrete platform. "But it's our view now, because we're taking over ... It's time for the Indigenous uprising." 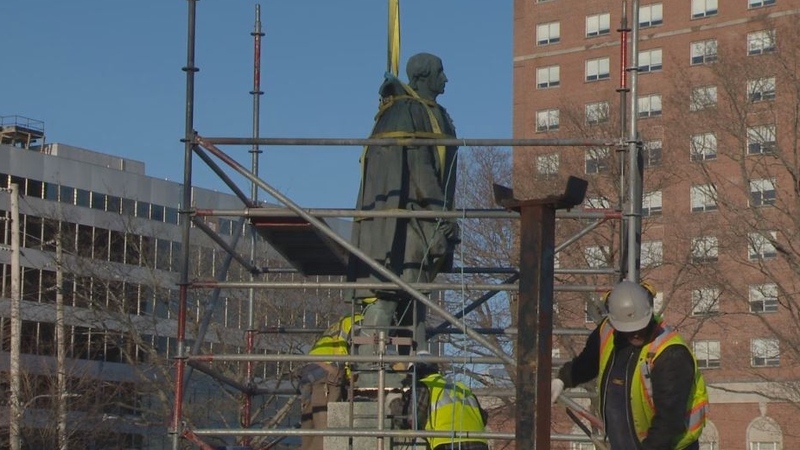 The event had originally been billed as a "Removing Cornwallis" rally to protest the statue, but that all changed after Halifax councillors voted last week to place the monument in storage while awaiting a decision about its long-term fate. 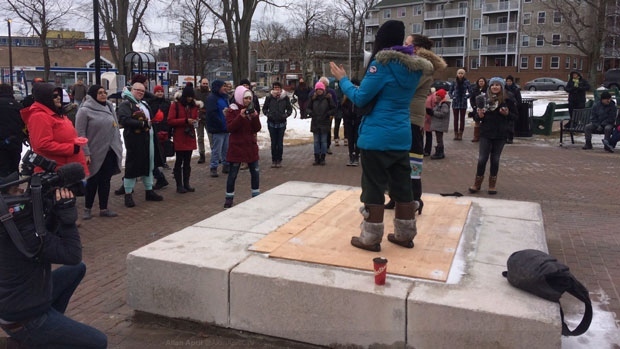 While only a fraction of the hundreds of Facebook users who had expressed interest in the event showed up, the mood was jovial as activists hailed the statue's removal as a victory in their years-long campaign to rid Halifax of its many Cornwallis tributes. A smudging ceremony was performed to rid the park of what Patles described as the "lingering negativity" left behind by the statue. "It was empowering to know our collective efforts were successful and that we were able to stand in the place where a genocidal statue used to stand," Patles said in an interview. "It just goes to show the power of the people, with us being able to be here today and celebrate his removal." Patles said she hopes this is just the beginning of the city's efforts to reconcile with its Mi'kmaq population, adding that Sunday's event was meant to "keep the pressure on." Mi'kmaq activist Rebecca Moore, who helped organize the event, said she had always expected to see the Cornwallis statue removed, but was surprised that Halifax council had acted so quickly. "It was kind of emotional to be standing there ... It was an honour, actually. It's a moment I'll never forget," she told reporters. "I hope to see a domino effect here, and I think that we will." The statue had become a flashpoint for competing narratives about Cornwallis's legacy in recent years. Some see the former Nova Scotia governor as a brave leader who founded Halifax, while others view him as the impetus of a 1749 scalping proclamation against Mi'kmaq inhabitants. After a municipal process to re-examine Cornwallis commemorations was derailed about a week ago, Halifax council considered a staff report that highlighted rising tensions around the statue, saying Sunday's protest could result in damage to the statue and personal injury. Police came to the park on Sunday to monitor the peaceful demonstration, and at least one person showed up at the gathering to push back against the statue's removal, expressing concerns about history being erased. But Moore, who helped organize the event, said the goal was to "unearth" a fuller account of history that recognizes the injustices suffered by the Mi'kmaq people. People on both sides of the debate agreed that putting the statue in a museum, with plaques outlining its historical context, could be a reasonable compromise. Shortly after the crowd dispersed on Sunday, a reporter for the Indigenous network APTN tweeted a photo of a teepee that had been erected near where the statue had stood. A celebratory rally is held at the former site of the Edward Cornwallis statue in Halifax Sunday, Feb. 4, 2018.